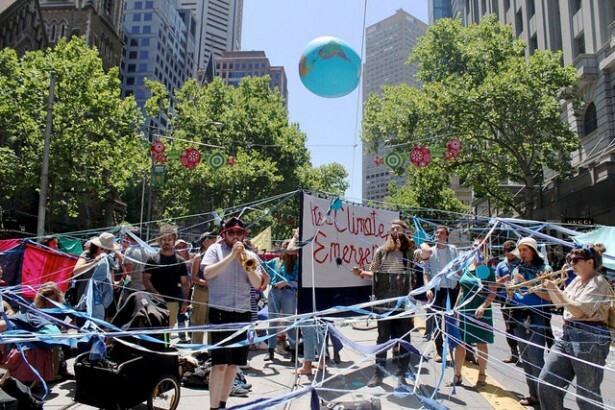 A recent direct action in Melbourne demonstrated that the real groundswell in the Australian climate movement is happening at the grassroots. I’ve long been fascinated by spider webs, and their potential for movement metaphor. One thread can seem so flimsy and insignificant, but bound together, and woven with care, it can create structures capable of holding immense weight. We might not all be linked directly, but through different strands and nodes we are all inevitably connected — and vibrations from one small piece can be felt across the web. Also, you can punch a big bloody hole through it, and it can still survive. 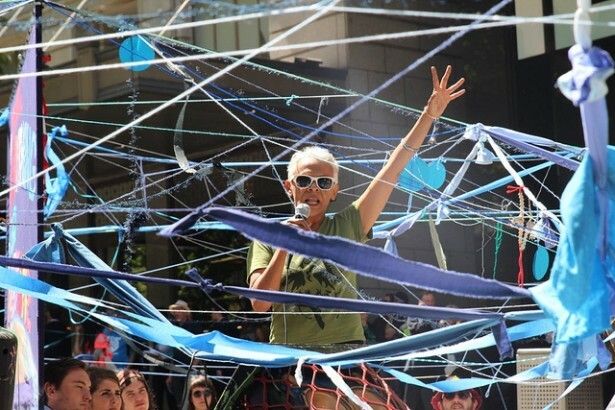 The web of resistance that Direct Action Melbourne wove with our Flood the System action earlier this month was better than I imagined, as glorious chaos and decentralized organizing allowed it to become a vision that everyone owned. I had an idea for an action. To find multiple sites in the city, where we could “connect the dots” and weave a web — both as a visual metaphor and as a literal blockade — to show the connections between climate change, capitalism and our finance sector. We also wanted to highlight the human rights injustices that play out on those most vulnerable: First Nations peoples and refugees from fossil-fueled wars. Of course, this was easier said than done. We had to find two suitable locations with a public road between in order to create both a strong narrative to link the ideas together, as well as a physical blockade. With a network that had less than a year’s worth of experience working together, as well as many first-time activists, it was a huge leap of faith to publicly announce an open civil disobedience action with the attendant police attention that it would draw. But that’s exactly what we did. Determination, sleepless nights and a handful of grassroots activists created a beautiful event that blocked the wealthy, corporate end of town, as well as a major city street, for four hours. We also blocked the entrances of a major Australian bank, Westpac, and BHP Billiton, the company responsible for the destruction of aboriginal homelands for uranium and coal — not to mention the worst mining disaster in recent history. Multiple affinity groups of trusted allies worked to shut down and secure the location, so that we could then open the space for the broader movement to join us. As huge amounts of police followed the hundreds of people from Federation Square, the excitement was palpable. Our web came to life — ribbons, rope and bunting criss-crossed the road, and physically connected the sites of BHP and Westpac, where teams locked onto the doors. It was joyous and fun, and it interrupted business as usual on affluent Collins Street. For nearly four hours, we did indeed flood the system. Like many climate activists across Australia, we were excited to see the beautiful resources and graphic narrative of Flood the System, created by Rising Tide North America and its vision for “movement momentum.” However, with the much shorter lead time and lack of resources, it meant some of the community organizing and aspirations for more diverse movement building went unrealized in our less resourced areas. In contrast, with significantly longer lead time, and likely hundreds of thousands of dollars of resources behind it — not to mention paid NGO staff, flyers and posters, and huge sound systems — the Peoples Climate Marches across Australia on the last weekend of November were huge, particularly in Melbourne. The movement building and coalition work was done better than ever before, but it was characterized by a complete lack of political demands or clear next steps, as well as fraught politics with First Nations people. It was only in the week prior to the march that the well-resourced campaigners considered the question, “Where to next?” They had worked on organizing the march for months, and the idea of having people walk around the city block, but had nothing else planned for them to do beyond that. In comparison, our budget was $500 — all for some padlocks and chain, paints and banner material, as well as second-hand sheets and yarn that were ripped up to make our web. Of course, there was also the hard unpaid work of a handful of grassroots volunteers. Our message was both complex, in terms of climate justice, but also simple. We made it clear that we had already written letters, signed petitions, lobbied and marched. So, it was time to intervene and get in the way of business as usual, where our government and corporations fail to act. This powerful and diverse action demonstrated again that the real groundswell in the Australian climate movement is happening at the grassroots. A huge campaign to save a forest and small community from a massive coal mine expansion project at Maules Creek in New South Wales has seen over 350 arrests in the last two years. Infrastructure provided by one of the larger NGOs ensured that the camp, hosted at a friendly local farm, had a kitchen capable of mass catering, toilets and an overall level of comfort that allowed diverse participation — from religious groups to choirs to bird watchers. Doctors, lawyers, scientists, farmers and local conservative voters participated in civil disobedience for the first time in their lives. Despite sustained action over years, however, it wasn’t enough to stop the mine from being built. The mining lobby has come out on the attack, flailing like a wounded animal, with misfiring PR campaigns that have landed to broad ridicule across social media. The brilliant coalition building work of Lock the Gate — a grassroots movement of farmers, traditional custodians and environmentalists organizing against unconventional gas — as well as my work with CounterAct, training activists for nonviolent direct action and associated campaigning skills, has come under attack by the mining industry and a parliamentary inquiry. It can surely be considered a huge indicator of our impact as a tiny grassroots group. 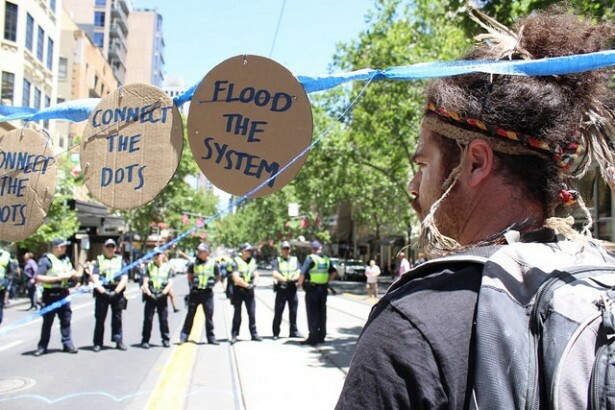 The Maules Creek #LeardBlockade campaign planted the next seeds of a movement that is sprouting and connecting people who felt the power of those mass actions and seemingly unlimited creativity of the smaller-themed lock-ons and tree-sits. From medics against coal to Batman taking to a tripod, or to a coal loader these creative acts of resistance are weaving our web stronger and broader than ever before. Those connections and deepened relationships were evident at a powerful climate action at Federal Parliament in early December. Despite international critiques of its approach, 350.org’s work in Australia has been largely well received. Its rapid building of skill sets and staff have enabled it to jump from the perceived rhetoric of its “Summer Heat” direct actions in early 2014 to the extraordinary Pacific Warriors climate flotilla and solidarity actions with grassroots groups late last year. 350 followed that up with its behind the scenes support for the massive “People’s Parliament,” an action that saw 300 community members from around the country converge in Canberra during the first week of COP21 to send a strong signal to government — that where they refuse to lead, the people will step up. The chants of “people before polluters” filled the grand foyer of Parliament and we heard from people across the frontlines of climate change: fiery Aunty Mabel, a traditional custodian from Bailai country; Zane, one of the Pacific Island Warriors; those challenging massive coal mining projects, such as the Rio Tinto Warkworth mine expansion; and people impacted by the Hazelwood mine fire. This growing diversity was also reflected in our Flood the System event in Melbourne. We had unionists, fiery anarchists, grandparents and young students — all taking action for the first time — along with refugee rights advocates and First Nations activists from Seed and the Warriors of the Aboriginal Resistance. With Australia being one of the world’s biggest carbon emitters per capita and having an embarrassingly isolated government — including a brand new prime minister who, despite the rhetoric and sheen, has conceded nothing to the environment movement — and a relatively conservative NGO sector still playing in-the-tent politics with business and government, it falls to those at the grassroots to push for the ambitious and bold response needed. As the Paris agreement landed to near universal acclaim across the mainstream environmental movement — with groups like the Australian Conservation Foundation calling the #D12 protests a celebration — the grassroots has a responsibility to call it what it is: something that was better than many expected, but absolutely not good enough. Naïve optimism is not going to cut it, nor will it show respect to Pacific Islanders’ call to save their homelands. As for the people on the streets in Paris, they need to be seen for what they were: many thousands drawing a red line, sending a strong signal that although this agreement might not have any teeth, it is time that we bare ours — not just in anger, but with defiant joy. After training people across the country in recent years, I am increasingly certain that the climate justice movement in this country — and perhaps in other wealthy nations — is not providing the pathways that concerned community members are ready to take. In times of crisis, the only reasonable response is to intervene, and it’s time for civil society in Australia and elsewhere to build the pathways needed to allow people to step into powerful nonviolent direct action. For us, in Melbourne and across the country, we saw an important next step as hundreds took action in the city for the first time and brought coal ports to a standstill along the east coast. We will now build on that momentum and join the international climate justice community in looking toward disrupting more infrastructure projects in 2016. Here in Australia, we hope to keep the Galilee coal reserves in the ground, and keep further unconventional gas at bay. In order to do so, we must continue to weave our web, drawing stories, culture, leadership and inspiration from First Nations peoples, as well as those on the frontlines of climate change. We must amplify their voices and become a richer movement in the process — weaving a web of resistance that connects us, despite our differences and what the flailing, dying fossil fuel industry and government throws at us. Nicola Paris is a climate justice activist and nonviolent direct action trainer who supports community campaigns with resources and training through her organization, CounterAct.